and other (the Hcam) mounted on the ceiling on the center line pointing straight down - to capture the ball path, left or right. This method has both cameras mounted on the ceiling - some 8ft apart. This method has both cameras pre-mounted and fixed in a single case that is mounted on the ceiling. 1. No calibration is necessary. System is essentially plug'n'play. 2. as all cameras are pointing downward - there's no requirement to use light absorbent materials (drapes) on the side walls. This drastically reduces the number of cables and wiring complexity of the system. 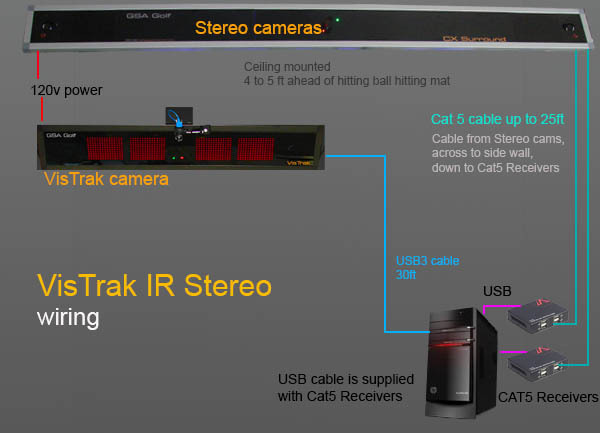 All CX Stereo and Surround systems come complete with built-in IR Lighting, full frame cameras, power supplies, cables and a line scan trigger camera. 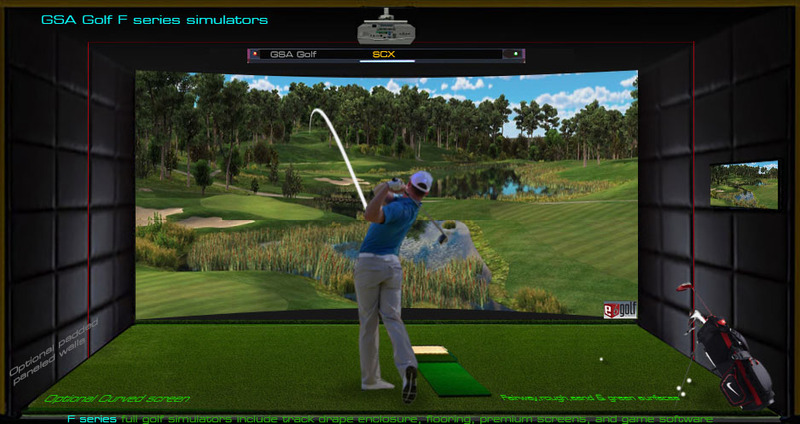 System includes TGC 15 course software plus RC single course software ! Alternatively, for those that object to applying tracking dots to their clubs, the PX1 optical sensor club tracking mat can be used. Some amount of calibration will be required though. Instructions on how to do this are published on the link below. How does the GSA Golf CX Surround / CX Stereo compare with the GC Hawk? i.e. is the GSA Golf Surround a poor man's GC Hawk like the SkyTrak is a poor man's GC2? Well, I'm sure many will make this comparison and - in fact - we do too. At present we don't have enough information about the GC Hawk to make a direct comparison but it would appear that the two systems are quite similar. Both systems use a stereoscopic method to determine ball launch angle, speed and path and are ceiling mounted. Does the GSA CX Surround also detect club head data? The CX3 Surround and CX3 Stereo feature a 3rd camera dedicated to this task. From what I hear, the GC Hawk at present does not detect any club data. Does the GSA CX Surround / CX Stereo also detect ball spin? Yes, the CX 4 Surround features a 4th camera that detects spin and spin axis. The above images show how back spin can easily be seen when viewing the ball from the side (as does the GC2 and our Bcam system). Viewing from the side, a full 360 degrees of rotation can be seen and thus spin rate measuring accuracy will be high. 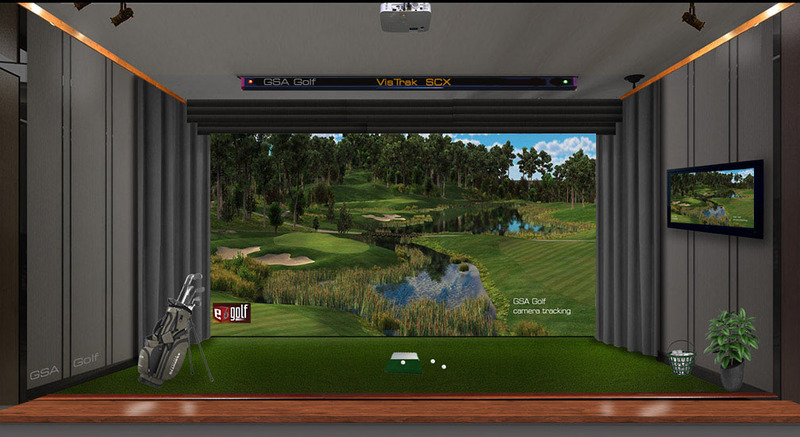 In contrast, if viewing the ball from above, the max amount of rotation viewable by the camera would only be around 30 or 40 degrees before the reference markings (virtual or real) would rotate backwards out of view of the camera. Note that the standard method of measuring ball spin with cameras is to grab two images of the ball at a set time delay between the 2 frames. 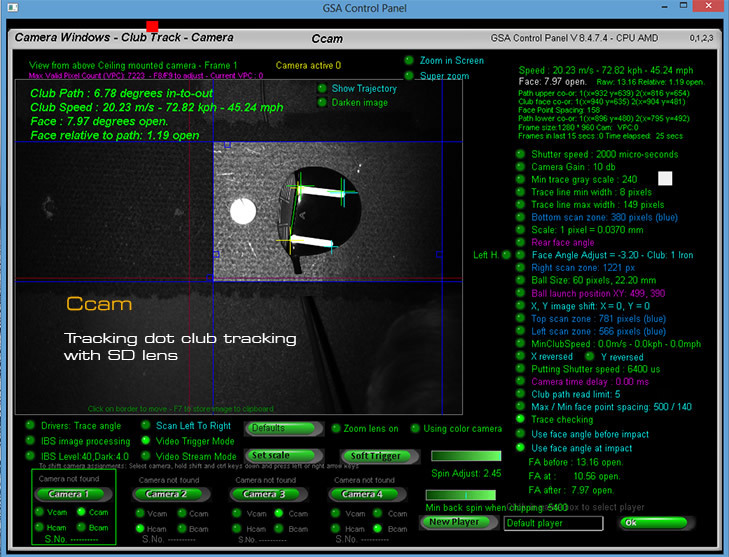 Image processing then detects a matching marking or dimple pattern in both frames that is used to determine the amount of rotation that ball has made within the frame time delay. Simple math procedures then determine the spin rate in RPM. Do I have to use specially marked balls with the CX Surround? No, you can use any balls with a black logo on it like the Callaway balls. What is the difference between the CX Surround and CX Stereo systems? However - because the camera mountings are fixed in the CX Surround - we are able to pre-calibrate the cameras saving you the trouble of going through this lengthy procedure. Other than that, the CX Stereo features the exact same cameras and electronics as the CX Surround but is split into two casings. However, whereas the CX Surround - due to its single casing - is confined to using a stereoscopic camera setup, the CX Stereo - due to its separate dual camera casings - can also be setup as a standard X,Y system. What is the difference between the CX Stereo and the CX2? Just the free software options to run as in a stereo or classic X,Y configuration. How does the GSA CX Surround / CX Stereo compare with the GC Hawk or about-golf's 3Trak price-wise? Not knowing yet what the price of the GC Hawk will be I can only guess, but all indications are that the GSA CX Surround or CX Stereo will only be around a third or a quarter of the price of the GC Hawk or aG's 3Trak. At present - and based on Foresights other product prices and a few golf sim forum - I'm estimating that the GC Hawk will be in the $15,000 to $18,000 range (as is aG's 3Trak we are told) while the CX Stereo / CX Surround is in the $,3000 to $5,000 range. 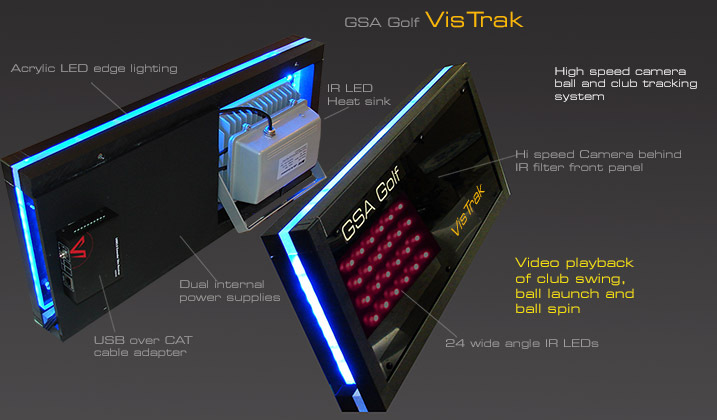 How many GSA Golf CX Surround systems are sold per year? We've (as of April 2019) have only just started production of this product so we can only estimate what the CX Surround's annual sales volume will be. 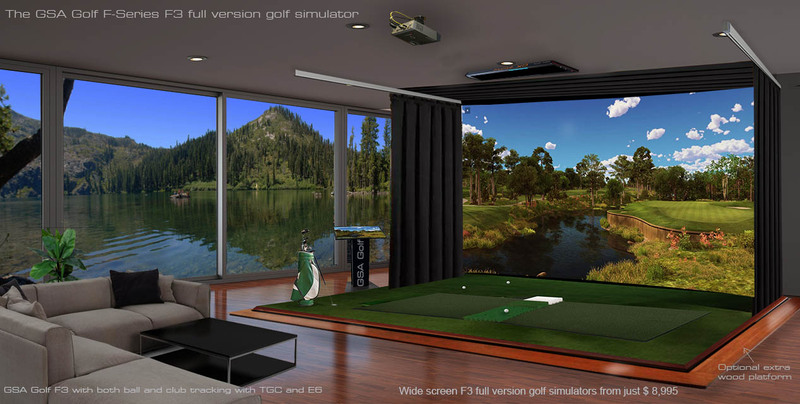 According to reports we've heard, the annual sales volume of the ForesightSports GC Hawk - priced at around $15,000 - will be selling in the 500 per year range. If that's the case then the GSA Golf"s CX Surround - which does essentially the same thing but priced at just $3,499- should out sell the GC Hawk 4 to 1. i.e. 2000 units per year. That's probably not going to be the case though. Our - more realistic - estimate will be more in the 50 units per year range. i.e. 1 per week. However, judging from the response we're getting, it would seem we could easily be selling 100 plus units per year. 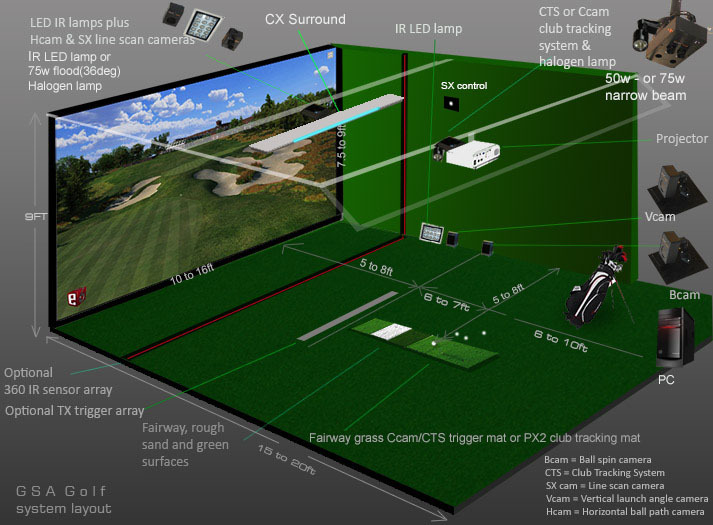 The GC Hawk is using 4 cameras for just ball tracking while the CX Surround is using just 2 cameras for ball tracking. 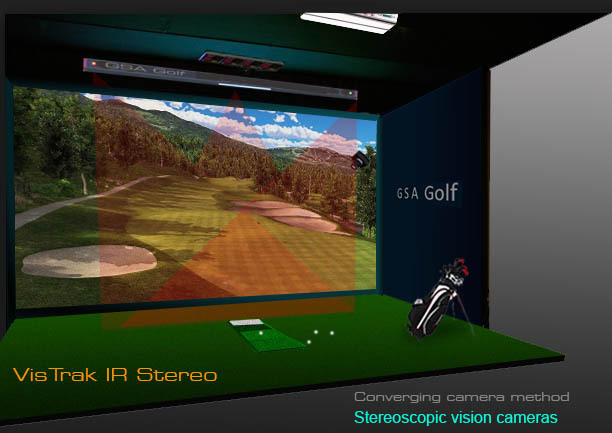 Why is this - and what is the advantage of using 4 cameras instead of just 2 cameras for ball tracking ? Dunno! - Well... it could be ( just a guess here mind you) that the 2 inner cameras in the GC Hawk are used to capture super high lofted shots that would normally be out of view of the 2 outer cameras. 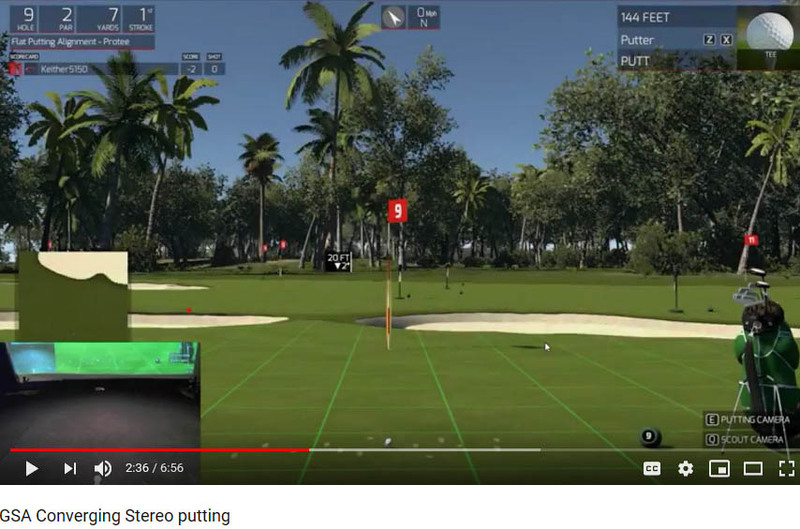 That's a bit of an issue with stereoscopic systems - the higher the ball, the more likely the ball will not be in the FOV of the cameras. Another educated (or wild) guess could be that the 2 inner cameras use zoom lenses to capture larger images of the ball - and thus more detail - that would be used to better determine ball spin and spin axis. There could well be other reasons for this that we are not aware of so don't take our word for it. If you really want to know, ask Foresight Sports - and if they get back to you, drop us a line as we'd interested to know that too. 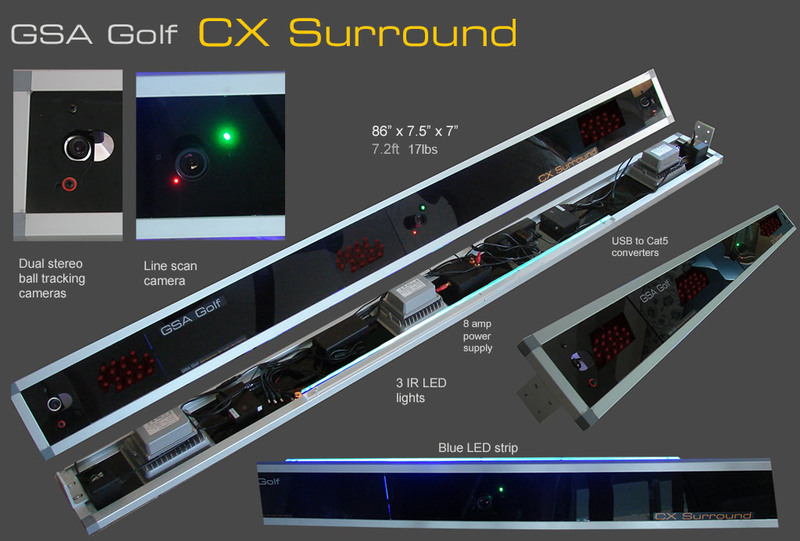 BTW the CX Surround uses up to 4 cameras as well but the other 2 cameras are used to capture club data (which - at present at least - the GC Hawk doesn't capture ) and ball spin. 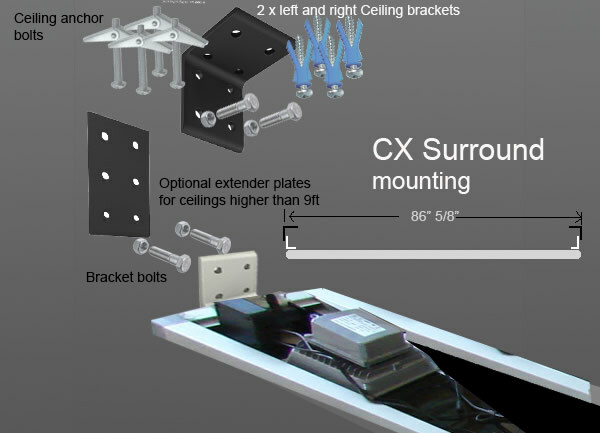 How difficult is it to install the CX Surround? As far as wiring is concerned, it couldn't be much easier (see above left diagram). Just two Cat5 cables connected to two CAT5 (supplied) receivers and 120v power. Mounting this 7ft long 17 Ilb unit on the ceiling may present more of a challenge though. Although it's simple enough (see above right image), it will probably be a two man job on two step ladders to get the unit up there. For those that wish (or have) to do it alone and don't have two step ladders and an additional helper, we'll be publishing instructions on how to mount the unit using a nylon rope pulley system. going in (left or right) and at what launch angle. Note that V and H cam calibration is quite a long and involved process compared to the simple 12 or so step stereo calibration process. Also note that with the new CX Surround, the cameras are pre-calibrated and thus no calibration is required. The V and H cam setups have additional lighting and a camera mounted at floor level which can be inconvenient and complex to setup. In addition. all wiring, power supplies, line scan camera, and all lighting are incorporated into one single unit. Compared to our standard CX2 camera system, this makes for a far easier and cleaner installation. which would (could) require a complex camera re-adjustment. With the stereoscopic setup the lighting is not in view of the cameras so there are no light ghosting issues. the ball traces in a stereoscopic system show no direct relationship to LA and path to the average user. 1. Cameras are pre-calibrated so calibration is unecessary. System is essentially plug'n'play. 4. All ball tracking cameras, power supplies and electronics are built into one case. 2. The images grabbed with CX Surround won't make much sense to the average user. 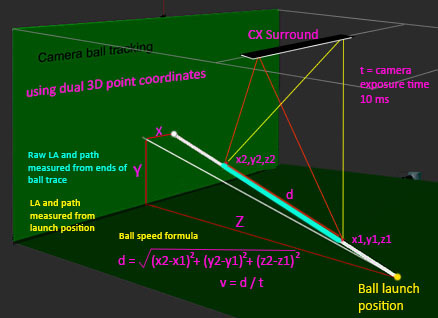 the images from the CX Surround are stereoscopic and use mathematical formulas to calculate ball launch angle, path and speed.